Comments Off on Does My Child Need a Ticket for a Musical Festival? A frequent question for parents when buying tickets to see their favorite artists/festival is; “Do I have to buy my child a ticket to go to the festival?” With the variety of festivals occurring year round in the US, there is a wide variety of child ticket policies. For most festivals, there is a simple age requirement for free entry but the age varies and some festivals include family-friendly areas. 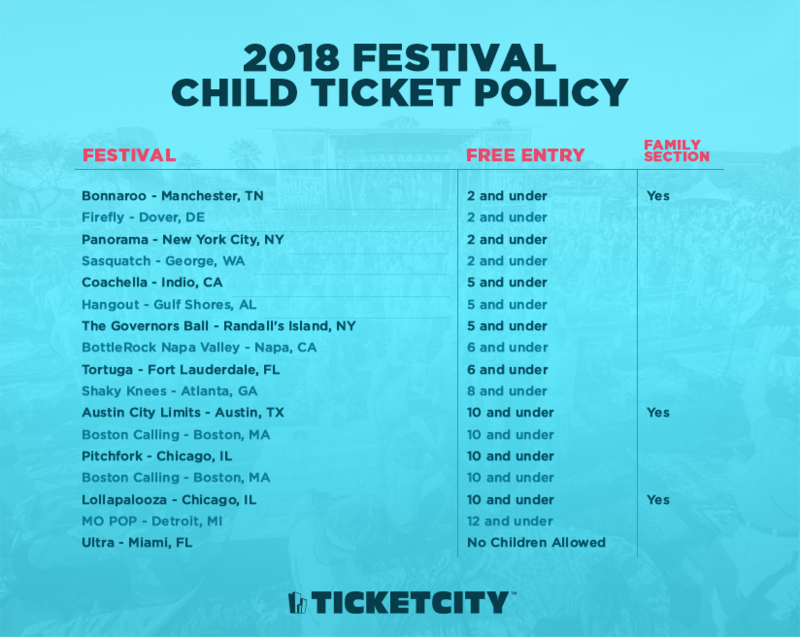 TicketCity put together a comprehensive list of all the Festival Child Ticket Policies and rules for some of the top festivals so you know what to expect when arriving at the venue. Hangout Music Festival: Under the age of 5 years old admittance is free with a parent/guardian ticket holder. Ages 17 and under are required to be accompanied by an adult over the age of 21. Shaky Knees Music Festival: Only 2 children allowed per ticketed adult. The Shaky Knees Festival recommends to not bring children under the age of 8 years old. Austin City Limits Music Festival: Only 2 children allowed per ticketed adult. ACL Festival is family/kid friendly with a dedicated Family Friendly Entrance and the Austin Kiddie Limits (11AM – 7PM) that provides arts & crafts and family-friendly music at the Austin Kiddie Limits stage. Lollapalooza Festival: Only 2 children allowed per ticketed adult. Lollapalooza is family/kid friendly with a dedicated Kidzapalooza (11AM – 7PM) that provides arts & crafts and family-friendly music at the Kidzapalooza stage. Stagecoach Festival: Kids 10 and under are free in GA; in C1 Corral Reserved Seating & C2 Corral Reserved Seating children under the age of 2 may sit on laps; in Corral Standing Pit only children 2 years old and under can enter without a wristband. For festival and concert tickets visit us here.